Maynooth Post Primary School is committed to preserving the privacy of all visitors to www.mpps.ie. This privacy statement relates to our practices in connection with our website. Maynooth Post Primary School fully respects your right to privacy. We will not collect personal information/personal data about you when you visit our website unless you choose to provide that information using the “contact us” form. By using this site, you consent to the collection and use of your information under the terms of this privacy statement which is in accordance with the Data Protection Acts, 1988 and 2003 and the European Communities (Electronic Communications Networks and Services) (Privacy and Electronic Communications) Regulations 2011. Please read the following privacy statement to understand how we use and protect the information that you choose to provide to us. When you visit our website you may wish to provide certain information about yourself, such as when you complete our “Contact Us” form. Maynooth Post Primary School does not collect any personal data about you on this website, apart from the information which you volunteer to send us in the “Contact Us” form. Any information which you provide using the “Contact Us” form is not made available to any third parties and is only used by Maynooth Post Primary School in line with the purposes for which you provided it (e.g. to contact you and answer any queries which you have raised in the “Contact Us” form or to address any other feedback which you send us in the “Contact Us” form) or for any reasonably incidental purpose. You are entitled to see the information we hold about you. On written request, we supply copies of your personal data which you may have supplied to us using our website. If you wish to obtain copies of this personal data, you should write to the principal of Maynooth Post Primary School and ask that he she provides you with an Access Request Form. The law entitles us to charge you a fee for doing so (which currently does not exceed €6.35). Your request will be dealt with as soon as possible and will not take more than 40 days to process. If you discover that Maynooth Post Primary School holds inaccurate information about you, you can request that we correct that information. 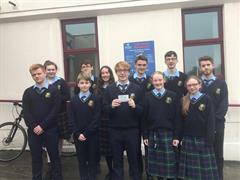 In certain circumstances, you may also request that data which you have supplied via our website be deleted (although you should note that if you request a deletion, you would generally be expected to identify some contravention of data protection law in the manner in which Maynooth Post Primary School processes the data concerned). Upon written request, we will supply you with a Data Rectification/Erasure Form for this purpose.